WESTBOROUGH, Mass. — Ten transmission upgrades have been placed in service in New England since October, ISO-NE transmission planning engineer Jon Breard told the RTO’s Planning Advisory Committee on Thursday during a Regional System Plan (RSP) project list update. Another 32 asset condition projects have been completed since then, most of them Eversource Energy structure replacement work. 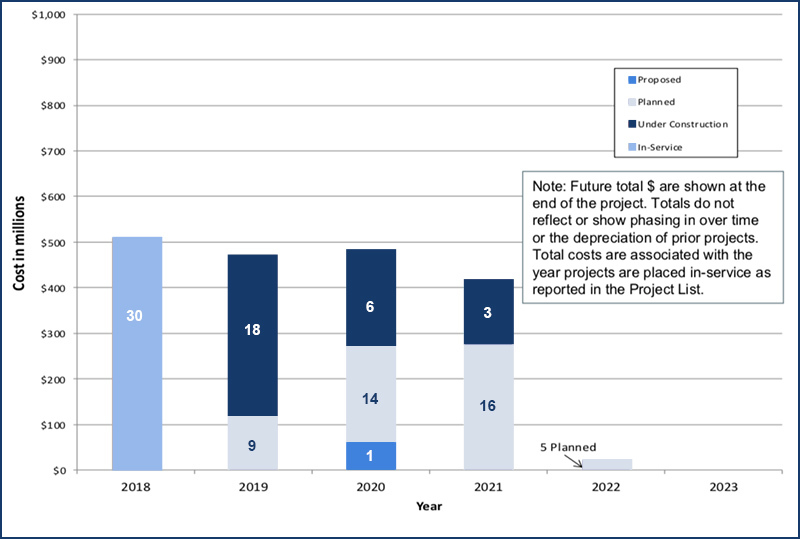 An additional 51 new asset condition projects were put on the list for approval — mostly by Eversource — with one project in Rhode Island, seven in New Hampshire, 13 in Massachusetts and the remainder in Connecticut. One stakeholder asked why the RTO lists a number of Southeastern Massachusetts/Rhode Island (SEMA/RI) projects not yet under construction yet. Eversource’s Robert Andrew replied that the proposal and board review process for a transmission project is long. “Once we get a project on the list, we start to do design work, local outreach, go through the state siting approvals, etc. — and those state approvals can be appealed,” he said. RTO staff expect to post a draft RSP19 for review by July 8, receive comments from the PAC by July 24, and post a summary of comments and preliminary response on Aug. 6. A public draft should become available at the end of August ahead of a public meeting in Boston on Sept. 12. The U.S. this winter set a new natural gas sendout record of about 150 Bcf on Jan. 30, but most New England local distribution companies reported new all-time peaks on Jan. 21, Tom Kiley, CEO of the Northeast Gas Association, told the PAC. Algonquin Gas Transmission hit a new system peak on Jan. 21 and its second-highest peak on Jan. 22, Kiley said, noting the pipeline ran 41 days at peak capacity over the winter — which is why the NGA supports new infrastructure development. Tennessee Gas Pipeline set a new systemwide throughput record on Jan. 30, and Iroquois Pipeline set a new peak physical delivery day on Feb. 1. Four natural gas utilities in Massachusetts have instituted moratoria on new gas hookups because of supply limitations, he said. “Consolidated Edison of New York just set a moratorium on new connections in parts of Westchester County, and that’s a big deal in an area of strong growth, with developers relying on having gas for their commercial, residential and industrial projects,” Kiley said, citing a New York Times story that day on the cutoff. 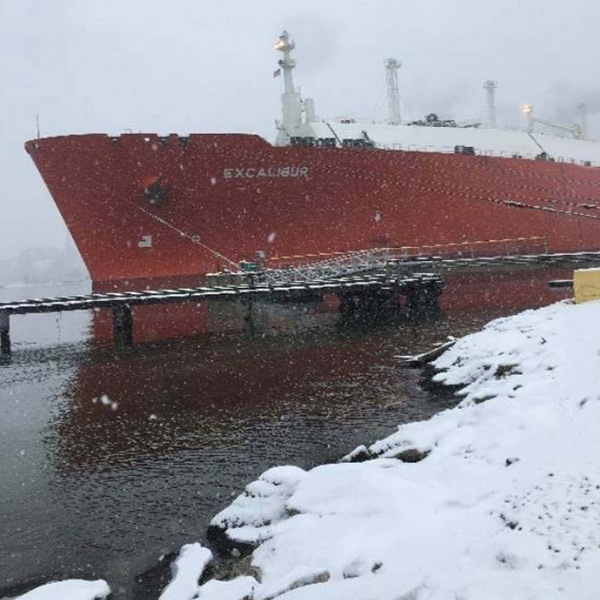 Regarding LNG, Kiley cited a March 12 report by the U.S. Energy Information Administration showing that estimated deliveries from New England LNG facilities rose from about 360 MMcfd on Jan. 19 to more than 700 MMcfd on Jan. 21. He said there were strong volumes this winter on key delivery days from Exelon Generation’s Everett LNG facility and from Canaport LNG in New Brunswick. In addition, an offshore facility owned by Excelerate Energy — Northeast Gateway — made its first deliveries into the New England system in two years and achieved record sendout on Feb. 1. EIA this winter launched a new website showing key New England daily data on electricity, natural gas and petroleum systems, Kiley said. ISO-NE will likely boost its annual long-term energy and demand forecast based on a projection for slightly stronger economic growth in New England compared with last year’s outlook. The forecast will be included in the RTO’s 2019 Capacity, Energy, Loads, and Transmission (CELT) report. The draft 2019 annual energy and summer peak forecast predicts 2027 gross annual energy will be about 3% higher than last year’s CELT, while the summer 50/50 peak demand forecast and summer 90/10 forecasts for that year will be down by about 1.8% and 3.2%, respectively, according to Jon Black, ISO-NE load forecasting manager. The gross load forecast does not include reductions from behind-the-meter solar (BTM PV) and energy efficiency. For gross energy modeling, the RTO abandoned annual models and instead developed separate monthly energy models to better capture shifts in seasonal trends, Black said. Compared with last year, the 2027 draft net annual energy forecast — which includes BTM PV and EE — is about 4.6% higher, with the summer 50/50 and summer 90/10 forecasts about 2.3% and 3.9% lower, respectively. “You might have multiple years without any weather extremes,” Black said, referring to the 90/10 peak load forecasts. The draft 2027 BTM PV forecast is approximately 1% lower than last year’s CELT, while the EE forecast is relatively unchanged. Last year the RTO predicted that BTM PV would reduce last summer’s peak energy use by 633 MW in both 90/10 and 50/50 peak conditions. 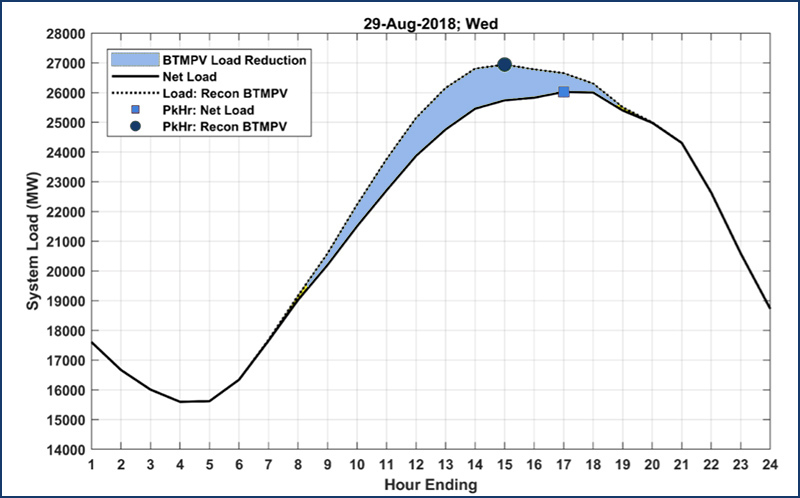 Actual BTM PV peak reductions in August 2018 ranged from 518 MW on Aug. 6 to 1,055 MW on Aug. 7. “It would be a stroke of luck if it hit 633 [MW] exactly,” Black said. “We’re just trying to use one value. … The way we came up with that peak load reduction was we analyzed BTM PV performance during a sample of historical peak days and calculated the reductions as a function of PV penetration.” To address demand forecast performance issues identified last summer, the RTO incorporated cooling degree days as a second weather variable in its modeling in addition to a weighted temperature humidity index. It also shortened from 40 years to 25 years the historical weather period used to generate the probabilistic forecast. Brent Oberlin, ISO-NE director of transmission planning, clarified the loads to be assumed in minimum, light and shoulder levels in the Transmission Planning Technical Guide (TPTG), which became a source of confusion after the minimum load level was revised downward in November 2017. The RTO will now reverse that change. Based on the trend of historic hourly loads, ISO-NE in 2017 reduced the minimum load level from 8,500 MW to 8,000 MW; additionally, a revision was made to ensure paper mill loads were included in the 8,000 MW total. Those industrial loads had previously been modeled separately because their nonconformance to the typical load cycles is important given their relative size and location. 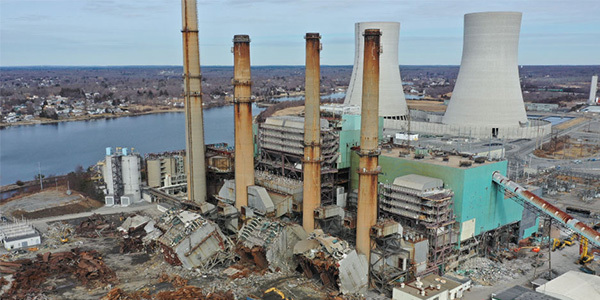 The TPTG currently describes the mill load as being part of the 8,000 MW of New England load, but it’s not clear what should be assumed if retirement of a mill with load less than 320 MW is considered. Under current practice, planners could infer that the rest of New England load is scaled up to keep the total 8,000 MW, which in effect says the remaining customers will consume more electricity to keep the total the same. Oberlin said the TPTG will now be modified to model the system with 7,680 MW minimum load plus the mill load. This prevents the non-mill load in New England from changing based on the assumption of the mill loads. Because the light- and shoulder-load level sections are similar, “we’re going to flip all three of them back to the way minimum load was described three years ago,” he said. The RTO has updated its Needs Assessments to reflect forecasts that continue to show a significant reduction in the net load to be served and a changing resource mix, Oberlin said. The latter was evidenced in last month’s Forward Capacity Auction 13, which saw Killingly Energy Center (632 MW) receive a capacity supply obligation. As a result of the substitution auction, Pawtucket Power (54 MW) will retire and Vineyard Wind received an obligation for 54 MW. In addition, the 48-MW Schiller 4 plant in New Hampshire and Maine’s Yarmouth 1 and 2, each 50 MW, delisted for the second year in a row, indicating potential retirement to grid planners. The Needs Assessment is aimed at avoiding unnecessary spending on transmission projects. Oberlin noted that eliminating a portion of the proposed transmission upgrade in Eastern Connecticut has the potential to save the region more than $20 million. Additional study continues to delay much-needed transmission upgrades, but the RTO is trying to strike a balance between moving forward and ensuring that ratepayers’ money is not spent unnecessarily, he said. The biggest impact on most study areas is the change in forecasts, with Western and Central Massachusetts also affected by the change in resources, which will impact energy flows from west to east. One significantly impacted area is SEMA/RI, which will see the retirement of Pawtucket Power and the addition of Vineyard Wind, which is being modeled for both 54 MW and 160 MW. Updates to transmission transfer capabilities and capacity zone development for next year’s FCA 14 are being driven by SEMA/RI Reliability Project upgrades and large generation retirements in the east, said Al McBride, the RTO’s director of transmission strategy and services. The planned upgrades include a new 115-kV switching station, a 345/115-kV autotransformer and several other 115-kV upgrades, all of which should be completed by the end of 2021, which will increase the import transfer capability of SEMA/RI. Large generation retirements in the area include Brayton Point, Pilgrim and Mystic 7. The RTO evaluated transfer capabilities of the SEMA/RI Import and West-East interfaces to examine the impact of the reliability upgrades and generation retirements, including performing steady-state thermal and voltage analyses. Any major retirements received for the FCA 14 capacity commitment period will be considered in the capacity zone formation process. A 1,200-MW external elective transmission upgrade (ETU) is also proceeding through the system impact study process, but with more than 6,200 MW of nameplate interconnection requests, enough new capacity exists in the study process for the Maine zone to become export-constrained, McBride said. ISO-NE Lead Engineer Steven Judd chairs the Eastern Interconnection Planning Collaborative (EIPC) Frequency Response Task Force, formed in 2017 at the request of NERC to adjust EIPC planning to test the Eastern Interconnection’s inertial and frequency response because of changes in the resource mix. Judd said reduced inertia because of increased penetration of nonsynchronous generation (wind and solar, new HVDC imports and battery storage) prompted the need for improved frequency responsive simulation models. The task force developed recommendations for improved frequency modeling: generator gross maximum power ratings; generator governor modeling; frequency responsive dynamics files; and the need for a new low inertia/minimum load library case. NERC also expressed concern with potential exposure to under-frequency load shedding (UFLS) events, and the need to establish the trending of interconnection frequency response over time. The task force recommends that NERC’s Multiregional Modeling Working Group (MMWG) consider creating a new library case to better reflect a historically low inertia/minimum load time period for long-term power flow and transient stability models. Currently, the best option available for a frequency response study is the five-years-out Spring Light Load (SLL) case, which does not match recorded historical minimum inertia recorded for the Eastern Interconnection, Judd said. A summary of issues discussed by the ISO-NE Planning Advisory Committee on Dec. 14, 2015. The ISO-NE Planning Advisory Committee discussed several changes in the RTO's procedures for 2017 and Eversource's aging transmission towers.